Utah’s Wasatch Mountains are famous for having “The Greatest Snow on Earth.” Snow-seekers in pursuit of world-class skiing and snowboarding contribute over a billion dollars annually to the economy. Snowmelt also provides the majority of water to rapidly growing populations along the Wasatch Front, including Salt Lake City. Understanding what controls snowmelt timing and magnitude is critical for Utah. It’s more complicated than warming air temperatures; the sun’s energy and longer daylight hours in the spring are the main drivers of snowmelt. Like wearing a black shirt on a hot day, anything that darkens the snow surface—such as dust—will absorb more sunlight and accelerate melting. As humans continue to alter landscapes, dust is more likely to blow onto nearby peaks. Yet scientists are just beginning to understand the impact of dust on snow. A new University of Utah study analyzed the impacts of dust deposition at an alpine study plot in Alta, Utah in the Wasatch Mountains. For the first time, researchers measured dust in the air and in the snow simultaneously. They found that a single dust storm on April 13, 2017, deposited half of all dust for the season. The additional sunlight absorbed by the dust darkened the snow surface, and led to snow melting a week earlier. The Great Salt Lake has been shrinking as more people use water upstream. Using computer simulations, the team modeled where the dust originated. They found that first, ahead of the storm, dust came from the south, but then shifted to the west. The westerly winds brought dust from “hot spots” in the Great Salt Lake’s dry lake bed, a relatively new dust source due to historically low lake levels. The study published online on December 21 in the journal Environmental Research Letters. 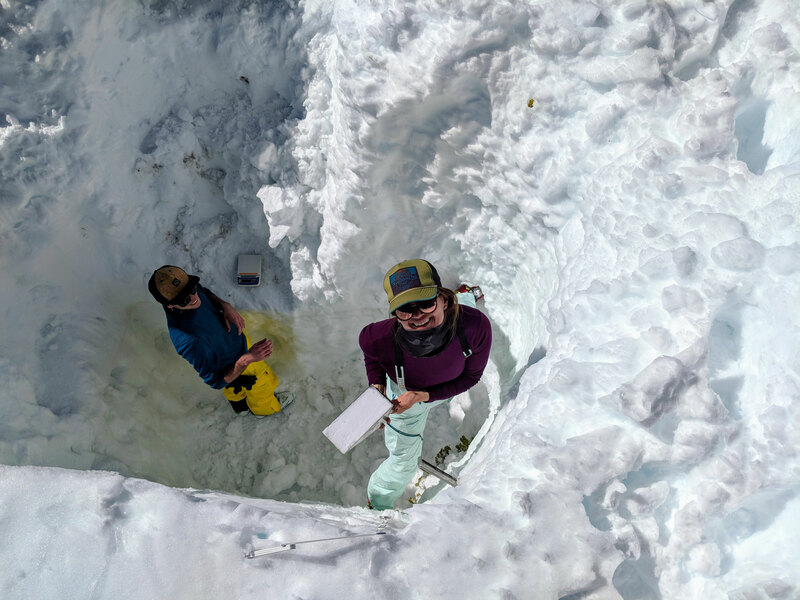 From snow properties and dust concentrations at Atwater Study Plot, researchers estimated the acceleration of melt due to dust. They found that the dusty snowpack melted about a week earlier. Skiles and her team observed five dust events during the spring of 2017, but focused on a single storm on April 13 because it deposited the largest volume of dust, and because the dust seemed to be coming from the Great Salt Lake dry lake bed. The team collected data at the Atwater Study Plot, near Alta Ski Resort in Alta, Utah. They collected data in three ways. First, they sampled the size and number of air-borne particles. Second, they excavated pits to analyze the snow’s properties and sample dust concentrations. Third, they used computer simulations to estimate where the dust came from, and where it would be expected to go. They were confident in the simulations because they captured the patterns in samples from the air and snow. To measure how the dust impacted the snow, Skiles calculated the difference in energy absorption between snow darkened by dust, and the same snow if it had remained dust free. The equation incorporates snow properties such as snow grain size, snow density, depth and aerosol mixing. The overall impact from dust was to accelerate melt by 25 percent. They found that most of the dust was deposited about an hour after the actual storm passed through, in the so-called “post-frontal” winds. 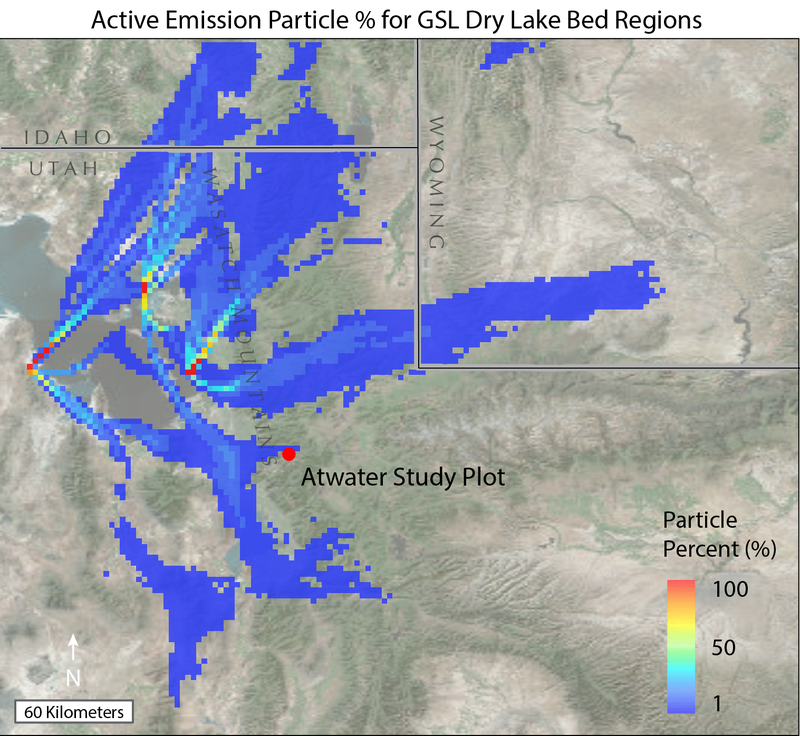 Sources such as the Great Salt Lake Deseret were the largest dust emitters; dust from the dry lake bed hotspots accounted for about 10 percent of deposited dust. However, the computer simulations suggest that much of the dust blew north of the study plot. Without snow observations in the region, the researchers were unable to verify higher dust deposition but they hypothesize that the impact was likely greater in the northern Wasatch. In October, Skiles co-authored a paper that reviewed literature on the growing global issue of “light absorbing particles” on snow in the journal Nature. The climate-science community has recognized the impact of aerosols that are clearly linked to human activity, like soot, but have yet to consider other particles that make snow darker and speed up melting. Skiles has studied dust on snow in the Colorado Rockies, but wants to continue to look at other mountainous areas. “I’m interested in looking in Wyoming, Montana and here in Utah because we need the regional perspective—we know that dust has a dramatic impact on snowmelt in Colorado, but what’s the impact like in other places? If dust isn’t as important in these regions, then what is controlling changing snowmelt patterns?” she asked. This study was co-authored by Derek A. Mallia, A. Gannet Hallar, John C. Lin, Andrew Lambert, Ross Peterson in the U Department of Atmospheric Sciences and Steven Clark of the U Department of Geography. Clark also works for the Utah Department of Transportation.